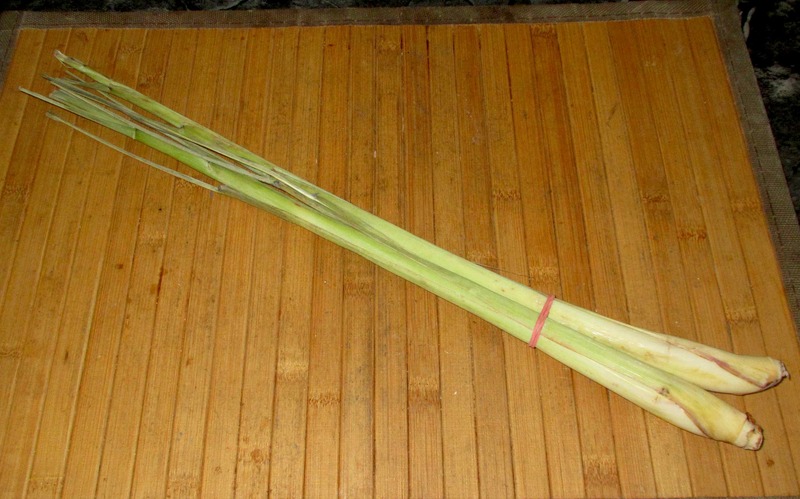 Fresh Lemon Grass is a common ingredient in many Southeast Asian culinary preparations and is most commonly ground with other ingredients to make curry pastes and condiments. My own personal experience with the spice is that, if used with a heavy hand, it can quickly overwhelm a dish with an overly perfume-like citronella quality. However, when carefully balanced with other aromatics, it can be very pleasant. The stalks of the ‘grass’ when just purchased have an appearance something between a scallion, or slender leek, and a reed. The tops and outer skins, as they dry, become very reed-like, and in some ways are reminiscent of corn husks, but the lower end of the plant is noticeably more tender as you approach the ‘bulb’ at the base. 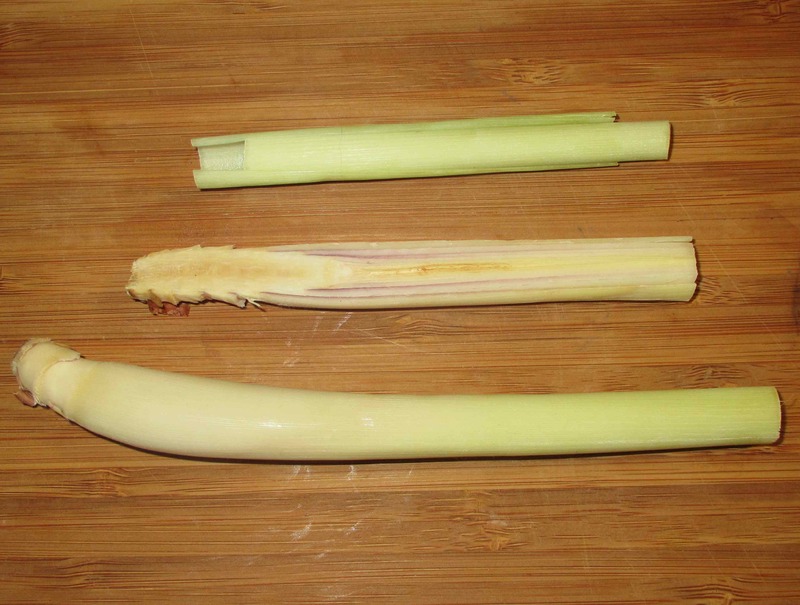 Once the outer layers are peeled away (much the same way one does with scallions), the inner layers are considerable softer but still firmer and more woody than with leeks or green onions. On further cutting and sectioning, you can see that the scallion-like structure is even more apparent. This particular plant even has a rather pretty violet color to some of the layers that contrasts lightly with the pale jade of the rest of the stem. I was not able to detect much of a smell before peeling the stalks but, once having stripped away just the very first layer, the rich aroma was immediately apparent. The smell is definitely lemon-like but it is more of what I would call air-freshener lemon, as it is a highly aromatic and perfume like citrus scent that can be quite overpowering in contrast to the comparatively delicate essence of real lemons. On tasting a small segment of the stem, the first sensation is of a surprising sweetness that is very much like sugar cane. This is followed by a brief grassy taste, rather like fresh, unripe corn, and then immediately the same aromatic citrusy perfume overwhelms everything else. The sensory experience is, on the whole, much like that of Citronella leaves (indeed, there is an extract of lemongrass called citronella oil), so though the English name suggests something lemon-like, the qualities are actually quite a bit different. The texture, I should note, is really quite woody and not unlike chewing on corn husks. Grinding this for spice pastes, which will be my primary use for this batch, will, I suspect be quite a chore in itself and I am thinking that, beyond that, using the stem layers in any other dishes will likely only work where there is a fairly lengthy cooking in liquid to break down the considerably fibrous quality of the plant. I still remember the first time I tasted lemongrass chicken at a Vietnamese restaurant, my tastebuds danced and partied like crazy. I’m thinking of doing chicken wings with lemongrass and ginger this weekend! 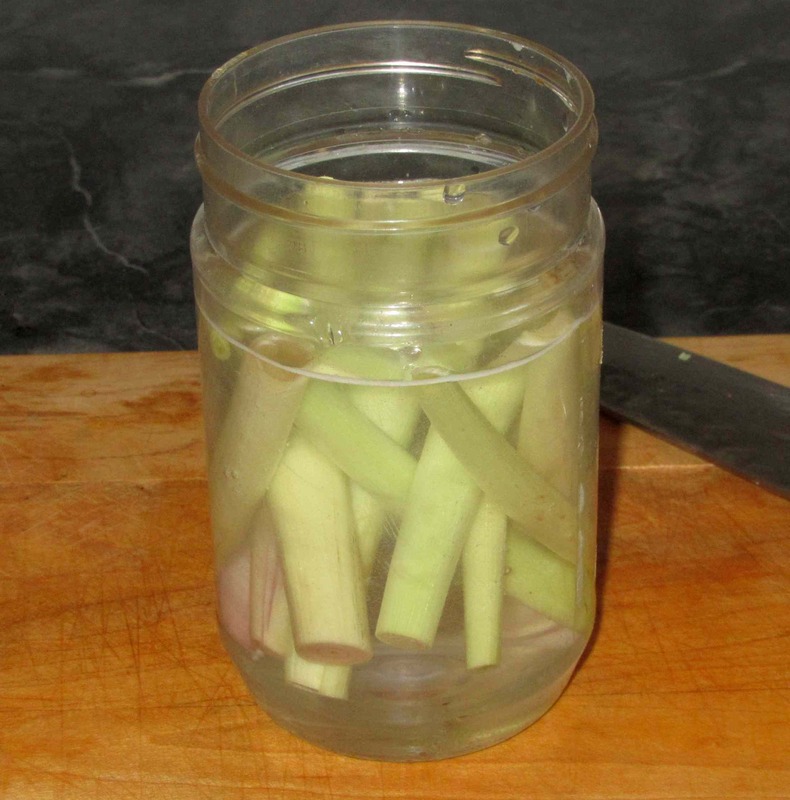 thanks for the tip on how to preserve the lemongrass because when i buy it, there’s usually some leftovers that just wilt in the fridge. Actually … this is the first time I tried this. It’s been a few weeks now and I just went and tested it…. looks fine, but I think I detect a slight fading of the brighter notes in the taste. Not much… but appreciable. I keep mine in the freezer, they can stay there without loosing any quality. Usually I smash the lemongrass with the handle of the knife and use them in soups or in woks, so I don’t need to process them before putting them in the freezer. .
That actually sounds like a better idea. I’ll do that next time.